The Dozens, the band that I do marketing for/help out with is playing a gig this Friday, February 29th at Connolly’s, in NYC. 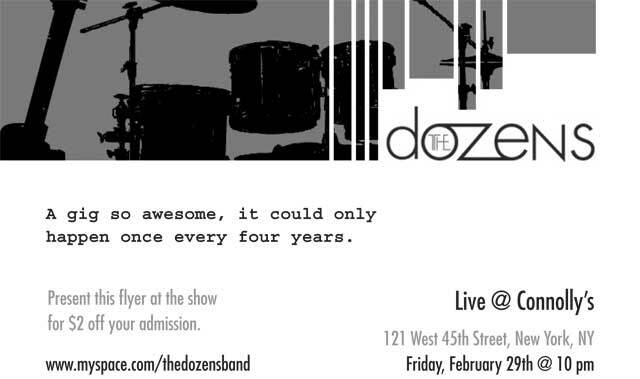 Come on out this Friday for “A gig so awesome, it could only happen once every four years”.. or so they say. Check out their myspace page and flyer for the show on Friday. LISTEN! Imagine putting the last 40 years of high-grade, head-nodding rock music into a blender, hitting spin, and pouring the mixture into a New York City four-piece. The Dozens set “standard” rock formulas on their ears, with melodies and chords that sound both utterly unique and familiar. While daring to forge new musical turf, they haven’t forgotten the value of an old-fashioned guitar hook, sing-along chorus, and well-pounded beat.Led by songwriter Eli Musser, The Dozens will be releasing their debut record – pleasing both head and heart – in 2008. However, their raucous live shows truly define this band’s exciting, contagious energy. The Dozens are quickly capturing the attention of music fans in the New York City area, and working hard to spread their message: Real rock is back.